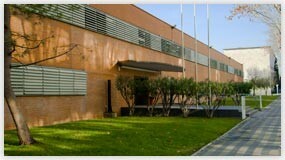 School of Mathematics and Statistics is one of the schools of the Universitat Politècnica de Catalunya - BarcelonaTech (UPC). It is located on the South-Diagonal Campus. The School participates in student exchanges through several mobility programs such as the LLP-Erasmus or Sicue Seneca. These exchanges are with universities in fifteen different countries thanks to more than fifty bilateral agreements that the FME has established. Almost 25% of graduates at FME spent at least one semester abroad and every year about twenty foreign students come to study at the School.